Forté Health surgical hospital - Acoustic Engineering Services provides measurement, design advice, and expert evidence in the field of acoustics and noise control. The Forté Health building on Kilmore Street was one of the first major building projects in the city centre to get underway after the Canterbury earthquakes. The building is a 3 level surgical hospital featuring state of the art patient and surgical facilities and seismic resilience was a key consideration in the design – particularly with regard to ensuring that the hospital could continue to function regardless of the circumstances. This key issue flowed right through to the acoustics design for the building, with the AES team required to collaborate extensively with other members of the project team –in particular with Klein Architects who were responsible for the design of the building interior. As this building was the first building in New Zealand featuring Steel Press technology which allows the building to move with a seismic event, and then settle back into its original position, extensive seismic detailing was required where walls within the building met external walls and floor slabs. A variety of details were developed which allowed for significant relative movement in the building structure while not compromising on noise control between spaces within the building, including wall elements which could slide over each other, and the use of flexible barriers to seal gaps. All of this meant that noise sensitive spaces such as operating theatres and recovery rooms could be protected, which a structural system providing 180 % of building code could still be employed. The project also had a strong sustainability focus. As internal noise is a significant factor in terms of occupant satisfaction and wellbeing AES considered expected levels of noise throughout the building due to outside sources like traffic and rain noise, and inside sources such as air-conditioning systems. The building design and mechanical systems were then modified as required to ensure expected noise levels complied with the New Zealand Green Building Council requirements. 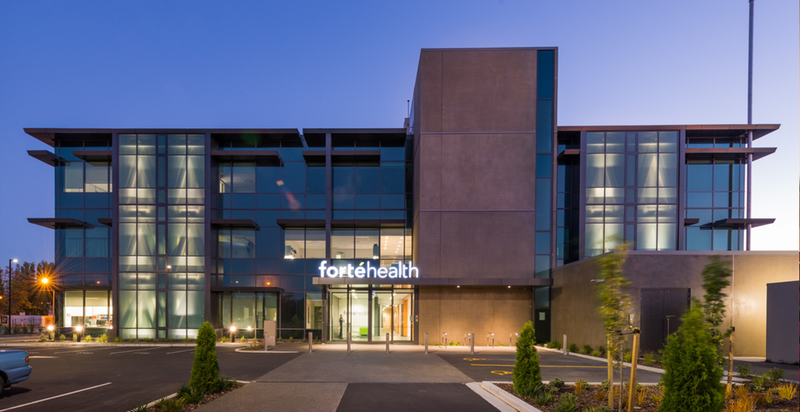 This work, along with many other sustainability initiatives, meant The Forte Health Building was New Zealand’s first hospital to achieve a 4 Green Star rating.